Swiss automotive visionary Frank M. Rinderknecht has never suffered from a lack of imagination. His creations always add a touch of burlesque at the Geneva motor show, and this year won’t be exception. 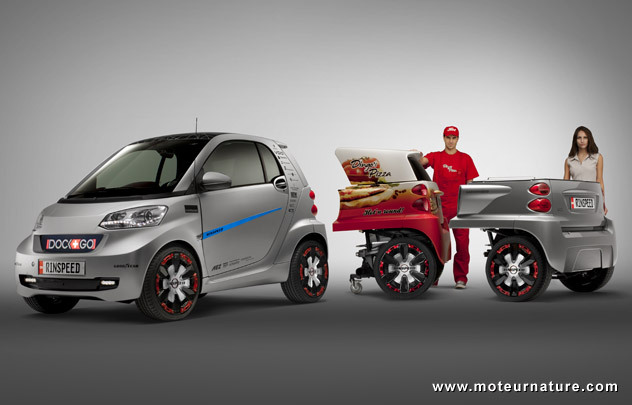 At the Rinspeed stand, M. Rinderknecht will show an electric Smart car that has been modified with the addition of a trailer. That doesn’t sound much original at first, but it is because that trailer has many faces. It’s all up to the driver. Does he want to travel long distance? 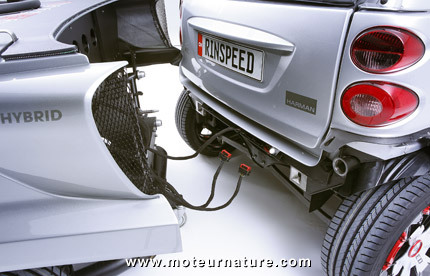 Easy, just add a range-extender device, a small gas engine hooked to a generator. Would he want to start a pizza delivery business? This Rinspeed Dock+Go would be perfect for this, as it comes complete with a heater to keep the pizzas warm. Another fun use would be for a DJ, or the driver may more simply want some extra cargo space. The Rinspeed Dock+Go will also allow him do get that.